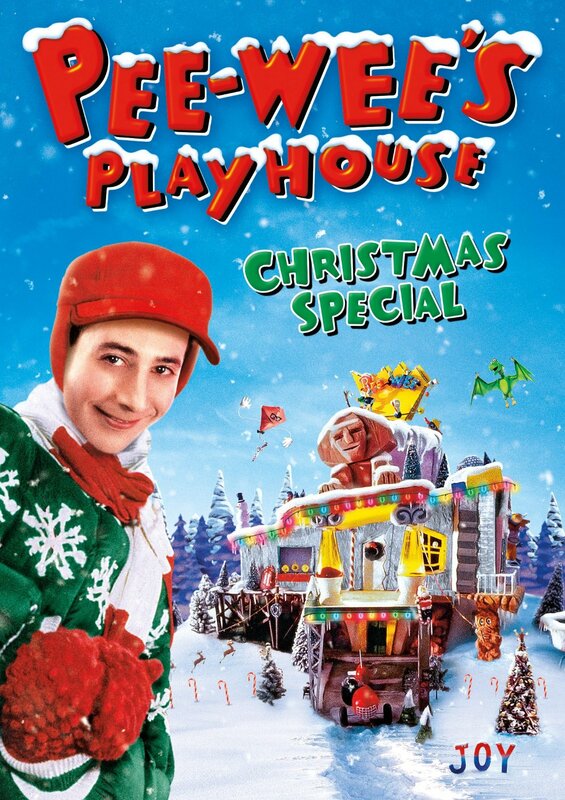 PLOT: Pee-wee Herman and pals are celebrating Christmas in the Playhouse in their own creative ways. As you can probably tell, this year’s 25 Days of Christmas Movies will be slightly different because the series will now include Christmas specials. 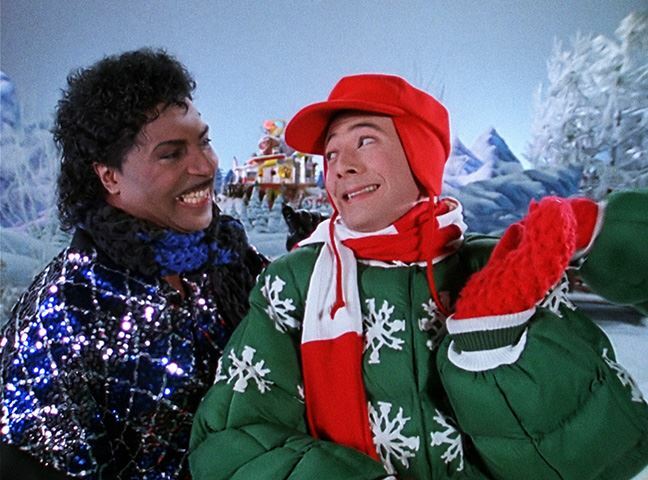 So there was no better way to start than with the 1988 “classic” Christmas at Pee-Wee’s Playhouse and boy, is this special both peak 80s and Pee-Wee. My first thought while watching this is was, ‘how did our parents let us this show?’ It felt like something that would come about while a group of people did a combination of coke and acid. Everything was face-paced and really didn’t fit together, and everything in the playhouse looked like something that would happen to your living room during a bad trip. I understand why kids liked it, it’s the same reason they watch Yo Gabba Gabba now, there are lots of bright colors and way too much enthusiasm about everything. It was definitely odd to watch as an adult, but completely void of entertainment as there were plenty of grown-up jokes that I probably didn’t notice as a child. Outside of all the normal wackiness of Pee-Wee’s Playhouse, this Christmas special had the added ingredient of awkward celebrity appearances. Each of the segments involving a celebrity was strange to say the least. The two that stood out the most were Grace Jones arriving in a box that was supposed to go to the White House and the interactions between Pee-Wee, Frankie Avalon and Annette Funicello where he basically treated the pair like slaves as they made his Christmas cards. Grace Jones was one of five musical acts (K.D. Lang, Dinah Shore, The Del Rubio Triplets, Charo) and was really the only one that seem to fit into the playhouse vibe. Funicello and Avalon were the furthest from odd cameos in the special; that honor would go to Whoopi Goldberg, Zsa Zsa Gabor and Oprah. It was really a mishmash of stars of the time and of the past, and the frantic pace that they appeared in actually fit with the show. For a Christmas special, it was very well done and didn’t take it self too seriously until the end. No, this was a children’s show for Christ sake. That said, there was a weird moment where a character had mistletoe in her hair and then, every character wanted her to kiss them. This ended with the floor character asking her to come stand with him; she was wearing a skirt. It’s Pee-Wee’s play house, so of course it is gaudy as hell. If there’s one thing he never did, it was subtlety. There are enough lights to illuminate a city block and entirely too much garland. Since this was a Christmas special, it wasn’t just the decorations that filled this special with Christmas-ness. As with most specials of the time, there was a hodgepodge of musical guests, including K.D. Lang, Grace Jones and Dinah Shore, who sang a range of Christmas carols while Pee-Wee, or his “friends” watched. 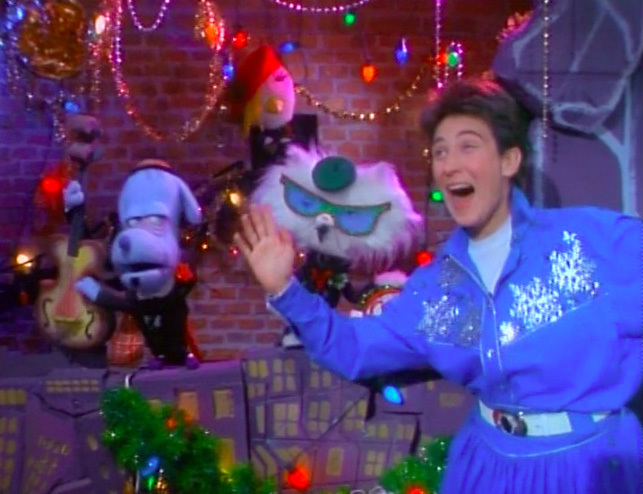 As with most episodes of Pee-Wee’s Playhouse, the Christmas special felt like a weird drug trip. It is completely disjointed, and at times, doesn’t know exactly how to transition between segments. Also, Pee-Wee is really mean for most of this show, and it’s played off as a joke. While I still don’t know if I would even recommend it for a riff-trax like gathering, I do know that it provided great insight into the differences between children’s television today and what it was in the late-80s.